This is Genevieve Johnson speaking to you from the Odyssey. In terms of the world's natural marine resources, we are obviously close to, and probably exceeding, the maximum global catch that it is possible to sustain. Stocks are currently in decline along every coastline, yet there are ever more humans to feed. In spite of how mad it is, even though the global catch of most species is no longer growing, the size and number of fishing boats, lines, nets, pots and traps continues to expand incessantly. Regardless of what direction you look the future appears grim, although we learned today that there is hope. This morning I spoke with Dr. Chris Chubb of Fisheries here in Western Australia. Chris is the Principal Research Scientist for the Rock Lobster Fishery. 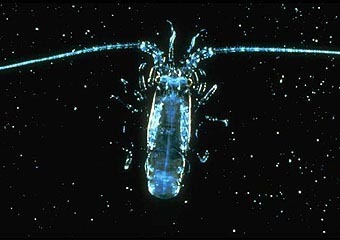 Phyllosoma - an early stage of development of the Rock Lobster. I'm Dr. Chris Chubb, I work for the Fisheries Research Division of Fisheries, Western Australia and I'm in charge of the sustainability research project. What we do effectively is understand the biology and natural history of the animal, we understand the fisherman and how they operate, how the fishery operates and then we provide that sort of information to the people who make the management decisions. The Rock Lobster fishery is a wild capture fishery. 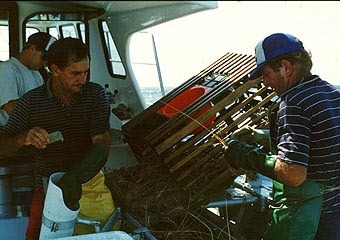 Fisherman use individual traps with individual identifying floats at the surface. There are a maximum number of pots within the fishery and a maximum number of licenses, something in the order of 68,000 pots with some 56,800 of them in the water at the moment. In fact we were the first fishery to receive Marine Stewardship Council certification as ecologically sustainable fisheries. It is very much a well managed fishery and one that looks after the environment as well. Predominantly our lobsters go overseas to export markets. Initially it was a tail market, a frozen tails market in the United States, but since then it's developed into whole cooked and live market into Japan, Hong Kong, Taiwan and China. These days it's worth to our fisherman somewhere in the order of 200 - 400 million Australian dollars a year, with 300 - 500 million worth of export dollars coming into this country. It's Australia's most important single species fishery. Back in the early 1960's when the fishery was really developing quite strongly, there was a push from both industry and government to make sure that things were going to be sustainable. At that stage, a limited entry fishery was introduced so that meant there was a cap on the number of boats and pots that could be used in the fishery. We have the breeding stock out here just of the coast at about 20 - 50 fathoms. Egg laying occurs in September through to January, while egg hatching occurs from November to March. Once the eggs hatch, they hatch into a thing called a Phyllosoma - a little leaf like animal that drifts off with the wind and the current and can be found 1,500 - 2000 kilometres offshore. 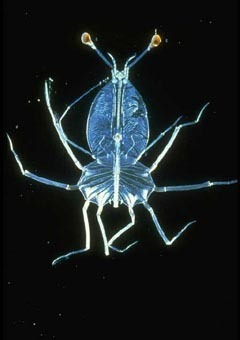 They live out there for about 9 - 11 months before coming back to the continental shelf edge where they metamorphose into Puerlus - where they are not quite a larvae and not quite a rock lobster. That actively swims across the continental shelf and settles in the inshore regions. They stay there for about three or four years and then they malt into what we call a whites false, it's a pale colored form and these animals migrate in late November each year out into deeper water where they become a part of the breeding stock a year or two later. Puerlus - not quite a larvae and not quite a rock lobster. Minimum legal size in this industry has always been 76 millimetres of carapace length. We do have a management rule in place, which for the first part of the season means that the minimum size is up to 77 millimetres but then it drops back again. So animals of that sort of size are probably around five years old, but of course we have no way of aging lobsters. Pots and traps are fairly well regulated in terms of their construction. They must have one entrance at the top and they also have to have three or four escape gaps around the side, of course these escape gaps allow the undersized lobsters to get out. We usually catch 5 - 10% sub-legal size lobsters and they have to go back over the side as a part of the management process. The reason we are so well advanced in our management is because the people before me had a lot of foresight in putting these monitoring programs in place. As a result, we have a long-time series of data sets, we have a lot of variation in the data that allows us to see the ups and downs. We are now actually able to predict catches, three and four years in advance and have been able to know when poor or good seasons are coming up. If you put all of that together, we have a very well managed fishery. The other big part of that is that we talk a lot with the commercial and recreational fisherman. That's the key to it all, the communication between the two groups. As a result, because it is so successful and it is so well managed, being sustainable in both an ecological and a commercial sense, a lot of other countries in the world are trying to do the same sorts of things that we're doing. Of course they have different sets of circumstances, different political regimes, different jurisdictions and so on, so it's not quite that simple, but yes we are used as a template in many countries. Rock Lobsters are caught in traps or pots. This program demonstrates that there are solutions to the problems created by overfishing, and that's good news indeed. 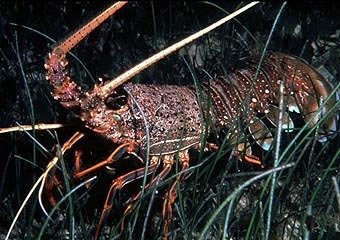 Projects such as the Western Australian Rock Lobster fishery prove that a long term, sustainable balance is possible. If similar methods and attitudes are adopted globally, we can still save much of the rich marine bounty on which humanity depends. All we need to do is to recognize the seriousness of the problem and act! Learn more about how you can select your seafood wisely. Read about the illegal fishing that goes on in Australia's vast unpatrol waters. Have you ever heard about the Patagonian Toothfish? Click here to find out more about the fish that is commonly refered to as "white gold".